Recent scientific studies have only underlined and confirmed the importance of good sleep, which has long been a key ingredient in a woman's daily beauty regimen. But just what can a woman (or man) do to ensure a good night's rest? Sleep aids? Going to bed earlier? Better pillows? Don't lose any sleep worrying...rest assured (excuse the phrase), that's why we're here! These six easy tips will help you sleep better at night and keep the wrinkles away while doing it! For silky smooth skin, invest in some silky smooth sheets! Silk or satin sheets can cost a pretty penny, but both are still cheaper than a face lift later! These fabrics don't wrinkle quite as roughly as cotton or linen. How does that help with beauty? Silk and satin won't leave impressions on the face, those kind of weird marks that can appear anywhere on the body after sleeping on a bunched sheet. Soft fabrics can conform to your body's natural contours and help maintain their proper form. Plus, they cause less friction against the skin, which avoids premature damage. Taking vitamins, as just about everyone knows, can help with good health, but did you know they can actually help you stay young looking? Vitamin B, C and magnesium help regulate the adrenal system, which in turn manufactures stress hormones. When a person takes a proper dose before bed, not only do the vitamins aid in the body repairing itself, they also help improve metabolism and reduce stress. A strong metabolism helps keep excess weight off, while simple stress reduction can prevent premature aging and help you sleep at night. Vitamin C, in particular, can help prevent aging when taken at night as it can actually help your body repair sun damage to your skin! 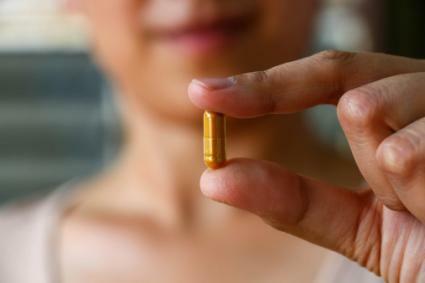 A Vitamin E supplement can help promote healthy, youthful skin too when taken before bed. Here's a simple trick for people who have a hard time falling asleep: try taking a shower! Showering can relax the body and mind, helping the muscles to let go of daily stress. Even better, showering affords an opportunity to remove all makeup and hair products before bed. Sleeping with excess makeup or hair product residue can accentuate fine lines or cause blemishes by clogging pores over night. But most importantly, a shower also helps regulate body temperature. To actually fall asleep, our body temperatures need to drop slightly. Cooling off after a shower therefore can help lead into sleep, and help you wake up looking healthy and radiant! For best results, take a hot shower about 20-30 minutes before bedtime. Towel off, and spend a few minutes cooling down before getting under the covers. You'll wake up feeling and looking more youthful! One of the best ways to fight aging while sleeping: sleep on your back! It's simple as that. 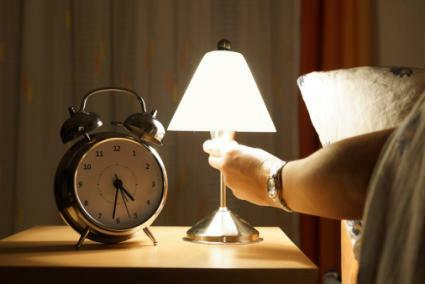 Sleeping on your side - or worse, on your stomach- actually can promote skin damage and wrinkles. Moreover, wrinkles in bedding fabric may also cause indentations in the skin. While often temporary, they can be unsightly in the mornings. Sleeping on your back keeps facial skin laying at a natural angle and can actually help even out wrinkles and lines that have already formed. We've all heard the euphemism "lights out" for bedtime, so take it seriously! In order to ensure quality sleep, make sure all lights are out in the room. Sleeping in the dark helps remove distraction and helps our bodies drift into deep sleep, during which the body and mind repair themselves. A good sleep mask can help with the process too, and selecting one of silk or satin can also help keep the skin around the eyes looking healthy. Not getting sound rest can result in puffy, red eyes in the morning, and that can enhance aging. Worse, they look just plain bad! When was the last time you invested in new pillows? Pillows are key to getting good sleep, and looking your best in all day long. Everyone has different needs when it comes to beauty sleep, so it's important to find a pillow that works for you. A good pillow shouldn't cause any allergy problems, and depending on the stuffing, can last anywhere from two to 20 years. When your pillow goes flat and can no longer trap air, replace it! Try to sleep with a pillow that elevates your head a bit - ideally at a 30-degree angle. The elevation prevents puffiness, especially in the skin around the eyes and ensures proper breathing-also vital to getting good sleep. Keeping the head elevated keeps your face and - believe it or not - your breasts looking firm and youthful. Isn't that worth a little investment?